F[\dropcap]acebook has released new data that shows holiday shoppers bought more products on their mobile devices in 2017 than in 2016. The social network saw online conversions on mobile during major shopping days increase, as consumers are increasingly switching to mobile. They covered 17 markets to track shopping activities on Singles’ Day, Black Friday, Small Business Saturday and Cyber Monday. In 2016, Facebook data showed that online conversions made on mobile surpassed those on desktop during the holiday season. The 2017 data shows a widening gap between them. Singles’ Day has become the largest online shopping day globally since the first one in 1993. Originally from China, we celebrate Singles’ Day every November 11 to market the date 11/11 on the calendar. Facebook data shows that Singles’ Day has spread globally from its Chinese roots. As a business (local or global), you may want to consider ramping up your marketing campaign during this day. Our 2017 analysis across 17 markets showed that on key shopping holidays, a greater share of online conversions occurred on mobile than on desktop compared with 2016. The increase was particularly notable on Singles’ Day. The US chart shows similar growth across all the holidays seen in the global trends. 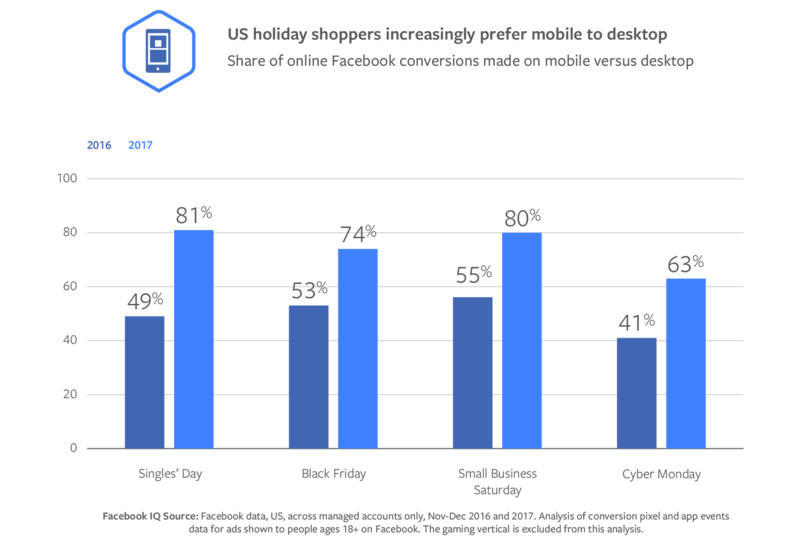 Facebook says holiday shoppers may be choosing mobile over desktop because they can buy products anytime, anywhere. It adds that purchases on mobile are easier now due to better transactions, cheaper data plans and more WiFi availability. With the shift to mobile, eMarketer stats show mobile ad spend increased to 62.5 percent of digital ad spend, and nearly 25 percent of total ad spend. Facebook highlights further that holidays are crossing borders. Singles’ Day had 1.3 times more online conversions on November 11 than other days of the month in APAC markets studied. Facebook says that Chinese ecommerce company Alibaba reported a sales increase of nearly 40 percent from 2016 to 2017. Black Friday had 1.8 times more online conversions in EMEA markets studied and 1.2 times more in APAC markets studied. The EMEA markets studied were Germany, Spain, UK, France, Italy and Poland. APAC markets studied were Australia, Hong Kong, Japan, Korea, Philippines and Thailand. As a marketer, it means holidays have become relevant globally. You may want to change the focus of your marketing plans during holidays and expand your business to new markets. Global connectivity will increase and people will learn more about ideas and cultural events from other markets. 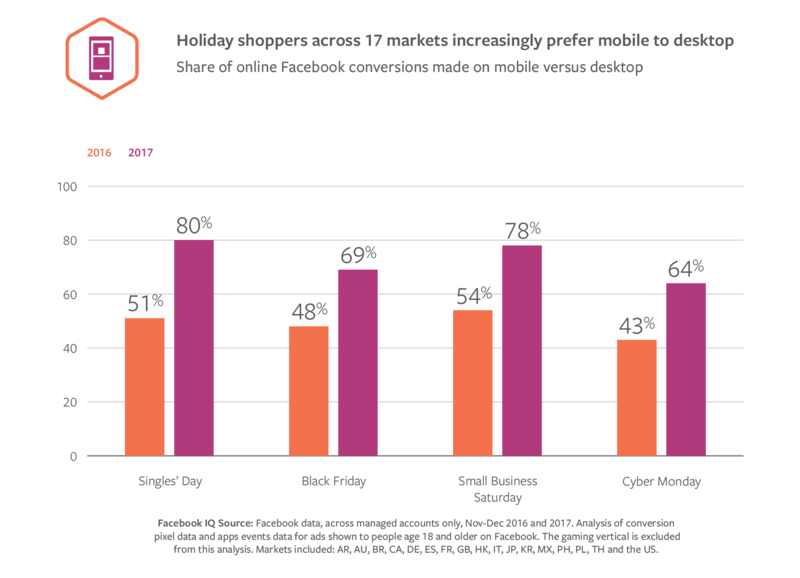 Facebook’s new report also shows that online conversions are increasingly happening on mobile. You have to capitalize on this trend. You may want to create a campaign strategy that focuses on mobile to reach holiday shoppers every step of the way of the purchasing experience. And you also have to ensure that your mobile transactions are seamless, simple and fast. Consider these trends early on in 2018.